Of the Oxbridge offer-holders, 11 (representing one-in-six of the cohort) are current WGS students who secured conditional places dependent upon achieving the required grades at A-Level, whilst four of last year’s leavers – with continuing support from Withington – successfully made gap-year applications and are now celebrating after receiving unconditional offers. 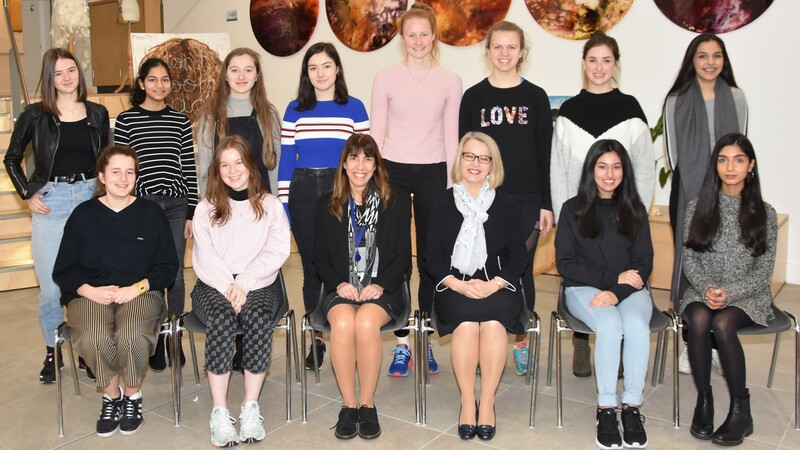 Oxford has selected nine girls for places on their undergraduate degree courses and a further six students hold Cambridge offers. They are now hoping to progress to the country’s oldest and most prestigious educational institutions to study for degrees in a broad range of subjects: from Music, Fine Art, Archaeology and Anthropology, History and Spanish with Linguistics to Medicine, Natural Sciences, Mathematics, PPE, Chemistry and Linguistics. Headmistress, Mrs Sarah Haslam, commented: “The Oxbridge application process is a demanding one and our 15 successful applicants are to be congratulated for securing offers on these very competitive courses – their success reflects not only their passion for learning and willingness to engage with ideas in discussion and debate but also their determination and resilience. At Withington all girls can participate in our extension activities and this makes for a collaborative, stimulating environment with a love of learning at its heart. With offers still arriving on a daily basis, Withington’s status as a gateway for entry to the UK’s leading universities is once again confirmed. Students are now looking forward to the opportunity to study at universities including Durham, Edinburgh, King’s College London, LSE and UCL. As with Oxford and Cambridge subject choices, students have opted to study for degrees in a wide range of subjects enabled by the number of A-Level subject choices they have at Withington. Head Girl, Florence Bradshaw, who is holding an offer to study Medicine at Newnham College, Cambridge, commented: “This year is certainly flying by. It doesn’t seem long since submitting our university applications in October and it is lovely hearing about all the offers coming in from many different universities to study a diverse range of courses. Ranked 20th in the country and top in the North West on A-Level results in the latest Department for Education tables, Withington is recognised as one of the country’s leading schools for girls aged 7 to 18 and also prides itself on the depth and breadth of its extracurricular opportunities. Based in Fallowfield, Manchester, the school enjoys excellent transport links including a City Centre shuttle bus and attracts pupils from a wide catchment area. Applications to join Withington’s Sixth Form in September 2019 are welcomed from girls who wish to be part of a friendly, vibrant and supportive community while benefiting from excellent teaching and the school’s well established track record in supporting pupils through their university applications process. Interested applicants should contact Admissions on 0161 249 3371 or email admissions@wgs.org.